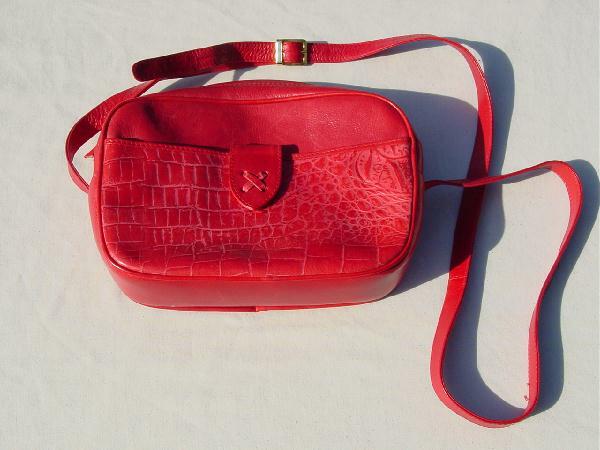 This vintage genuine leather red purse was made in Italy. It has a top zipper opening and a 49" buckled shoulder strap. There is an outer faux alligator pattern open compartment lined in black leather with a magnetic snap closure. The inner center section is also lined in black leather with red trim and has an open pocket. A model bought it in Florida and used it for 2 seasons in New York. She wore it with either the Coach belt or the L. Chessler belt, depending on what clothes she had on.